Leading Proudly-Filipino handset brand Cherry Mobile joins the entire nation in celebrating the 120th Philippine Independence Day by launching a meaningful Facebook promo that clearly instills Pinoy Pride among its followers. According to Ms. Agnes Conopio, PR Head of Cherry Mobile, "The #JuanCherry Facebook promo encourages all Filipinos to show unity and to be proud of our heritage. It also means that Cherry Mobile is a brand that represents Pinoy Pride, which is also highlighted by our slogan, #TatakCherry #DugongPinoy for Every Juan." Through #JuanCherry, CM will give away 120 very cute Cosmic Plushies or plush toys to select fans who will follow Cherry Mobile on Facebook and Instagram, use the new #JuanCherry Facebook Frame on their Profile Photo, and post a Facebook entry using the #JuanCherry hashtag. 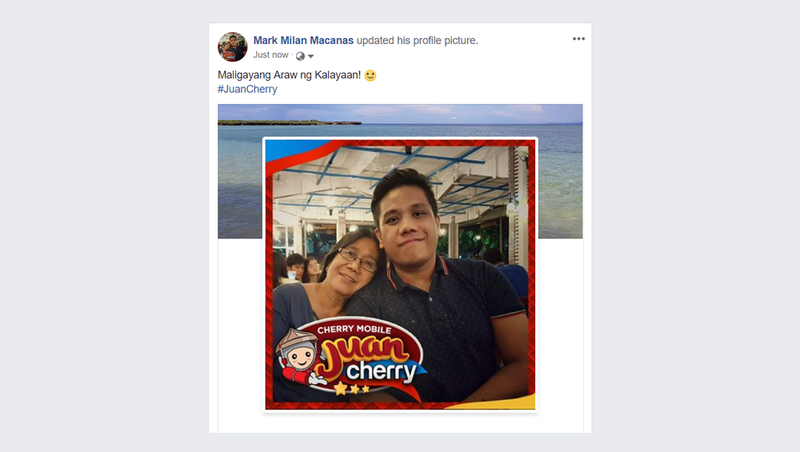 If you want to join in the celebration, you may begin by visiting this Facebook post by the Official Cherry Mobile Page on your smartphone and click on the "Try It" button under the Frame image to implement or add it to your profile photo. It's very easy! A true source of Pinoy Pride, Cherry Mobile has clearly become the leader in our local mobile industry by offering affordable smartphones, which serve as viable alternatives to expensive models by international brands. In 2012, when Pinoy-branded smartphones were still not widely accepted or embraced by consumers, the first-generation Cherry Mobile Flare took the market by storm and surprised everyone by becoming the best-selling entry-level Android smartphone that year -- thanks to its stellar features, matching that of far-more-pricey devices by global companies. The unprecedented success of the CM Flare Series paved the way for the growth of the local smartphone industry, with Cherry Mobile - to this day - still standing at the forefront.